Sheet pan dinners are all the rage these days and for very good reasons. They are super easy to make, eat, and clean-up! One of my favorites is this Kielbasa, cabbage, & potato version. We have that one relatively frequently. 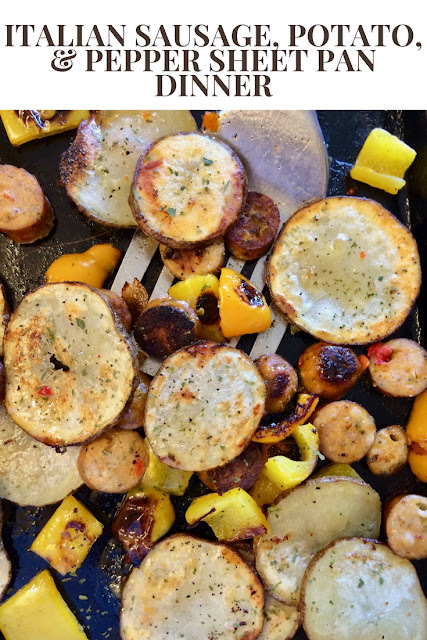 This one with Italian sausage reminds me of foil packets we sometimes make for camping - full of sausages, potatoes, and peppers (sometimes onions, too). We have had such a very long and cold winter this year. It even snowed a little this morning again and it's almost May! I'm ready for things that make me think of warmer weather and this type of dish reminds me of campfires and grilling. It makes for a simple yet flavorful dinner or lunch for about two to three people, but can easily be adjusted for more just by adding more of what you like. I like to use two sheet pans to help everything brown up nicely instead of steaming. However, you can try to put everything on one if you prefer. Preheat the oven to 425 degrees. Drizzle the olive oil across two sheet pans. Slice the sausages into about 1/4-inch rounds and spread onto the sheet pans. 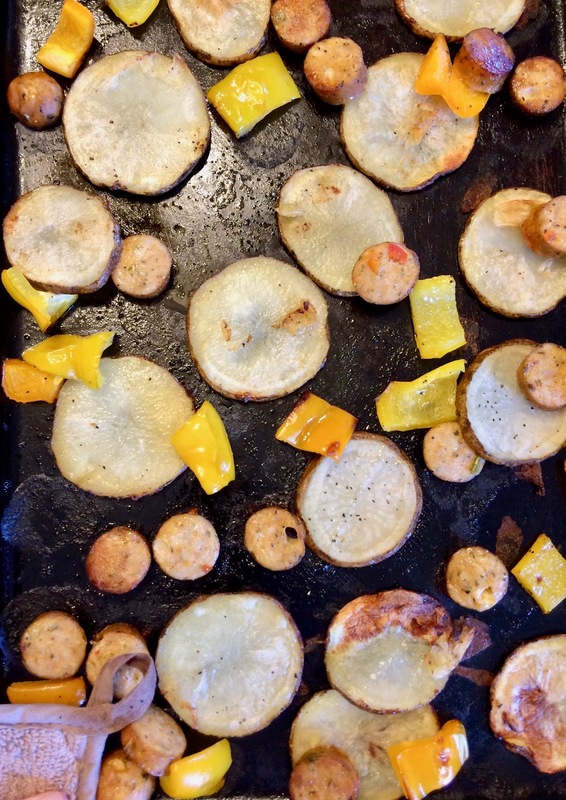 Slice the potatoes into about 1/4-inch thick slices and spread onto the sheet pans. Seed and chop the pepper and spread across the sheet pans. Sprinkle with the garlic powder, salt, and pepper. Place in the oven and cook for about 8-10 minutes, until the bottoms of everything are golden. Flip with a spatula and return to the oven for another 7-10 minutes, until everything is fork tender and golden. Stir and sprinkle with parsley. Serve with a drizzle of Italian dressing. I would have to double the portion :-)) Looks so very delicious and comforting..a great meal, Amy. I haven't done much with sheet pan dinners, but I'm warming up to the idea (I'm more of a skillet person). And with this recipe? Wow, who could resist? Lotta good flavors going on here. :-) Thanks! 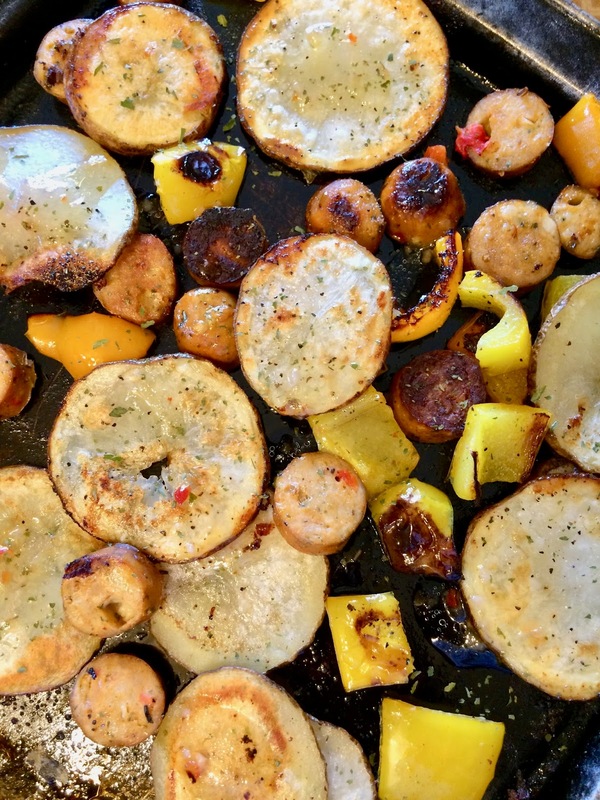 what a great sheet pan dinner! i like the fact that you sliced the potatoes rather than dice them. delicious! Sheet pan dinners are awesome, and I love that they're easy and quick, too. Love the italian sausage and potato combo, it's the perfect hearty meal! Sheet pan dinners are always a hit, especially when you start craving comfort foods in the Fall. Sheet pan dinners are the BEST! This looks so yummy. Pinning! !